The ‘Harry Potter’ series by J.K Rowling will always go down as a classic books series along with the likes of ‘The Chronicles Of Narnia’ by C.S Lewis and ‘Sherlock Holmes’ by Sir Arthur Conan Doyle. Back in August of this year, me, Guide Dog Blossom, my girlfriend, and family got the chance to go to the ‘Harry Potter Studio Tour’ in London. All have always been huge fans of the series, so we were all really looking forward to this immensely. This trip had been booked a few months before, which is highly recommended as the tickets will sell out really quickly. Once we had arrived (in a bit of a rush and a panic, as we were running a little late) we made out way through the crowds of people to the ‘Guest Services’ desk. Back when booking the tickets, I had also phoned them up to tell them that both I and my girlfriend were visually impaired so, I wanted to find out what was available to us in terms of accessibility. They answered, by saying that some commentary headsets would be available and that also we would get our own tour guide to take as round the tour. Once we got the ‘Guest Services’ a lovely staff member by the name of Carmen greeted us! We said that we had booked some assistant and once she came back after checking with staff, she said that she would be happy to take us around. Carmen, help us to the entrance and said that she would return once we had reached the other side. We walked through into a giant room with some huge screens on both side walls showing all the Harry Potter film posters. Once the staff had filled the room with guests, they began to play a short film, showing an interview with the director of the Harry Potter films David Yates. After, the film had finished, the doors open to a small cinema screen. As I had Blossom with me, the staff kindly placed us on the front row so Blossom could happily lie down. Once everyone had settled and were seated, another staff welcome us again and said that we were going to watch all eight Harry Potter films back-to-back and that he’d see us to three days! Some people were actually quite happy about this! I don’t want to go into detail about what happened next, as I don’t want to spoil it for everyone, but what I will say what happened next was amazing! Once we had been through the introduction and were free to roam about as we pleased, Carmen met up with us again and started to takes us around and showed us some key things that you get to see! Whilst going around with her, she showed us some key props and sets from the films and told us somethings that you wouldn’t get to know if you were just going around on your own. Some of the things Carmen showed us we got to touch and feel to get a better understanding of what it looked like and how it was used in the film. Some of the things Carmen showed I didn’t even think were physically real. When you watch the films, in some scenes you sit there and think ‘ah that was probably done my computer!’ But actually it wasn’t, which was amazing, some things actually moved and worked! It was brilliant! Not only were there things to look at, but there were also things to do! As we were going around the tour, there were several activities using a green screen, that you could dress up as a Hogwarts student and take part in! This was so much fun! Whilst I was going all these, Blossom was left with my mum. I got told later that Blossom had this confused look on her face as if to say: “why is dad sitting on a stick?” After the various activities, your photo and some videos were taken, after which you purchase them. Which of course I did! Whilst we were going round we got to ask Carmen all these types of questions and almost every question she expertly knew the answer to. There were a few she didn’t know, but to be fair they were some pretty daft ones, mostly asked by me! Once we had got halfway around the tour, there was a large cafeteria, where you could buy food and drink, we had already eaten before we had arrived, but it was a chance for us to take a breather and take the load off. I went and bought a ‘Butter Beer’ whilst my mum, brother and my girlfriend all had normal soft drinks. Carmen showed us to a table and said that she would go off and have a break and come to us. After about twenty minutes, Carmen came back and we continued the tour. We moved on and went to see some physical sets, which the actors had actually used, we got to go in them!! Which was again amazing! Every time I sit and watch a Harry Potter film now, I sit there and think ‘I’ve seen that’ or ‘I’ve been in there’ or I’ve touched that!’ Carmen showed us some special effects props which again we got to touch and feel, at one point she showed us a hand that we got to touch. At the time we felt really strange because even though you knew it wasn’t real, it felt like it was, so my brain wasn’t sure how to process that! But then came the one thing that blew us all away! We turned around a corner, and there ahead of us was…the Hogwarts castle! The sight was absolutely beautiful, it was all lit up and cycle from day to nighttime. At night all the lights in Hogwarts Castle lit up, and it felt as though it was alive! We spent some time taking numerous photos, I had taken so many photos that day, but one of the photos, of me, and my girlfriend standing in front of the Hogwarts castle is by far my favorite photo of the whole visit! To the point where now, I have it framed and sitting on display at home. We could have spent hours in that one room alone, and truthfully I didn’t want to leave! They had music playing from ‘Harry Potter & The Goblet Of Fire’. Now, when I listen to that song it always that’s me back to that one moment! Erm…anyway moving on! Once we had exited, we then came to the end of the tour and into the shop! Now anyone who knows me will tell you that I really enjoy shopping, so combining ‘Harry Potter’ with shopping…fatal! Now granted I went online to their website a few days before so I already knew what I wanted. There were a few times where my mum had to say to me: “now are you ever going to use or wear that?” “probably not…” I said, “but it’s Harry Potter!” In the end, I only came out with two items, a Gryffindor jumper, and a Gryffindor backpack and was red with gold zips! After we had paid (well, I paid), Carmen then escorted us back to the car, I let Blossom go to the toilet as she had been so good whilst going around, that she hadn’t had a chance. I think even she enjoyed herself, there was one moment where we went into the forbidden forest and she wasn’t a fan, so Carmen asked for the sound effects to be turned off whilst we were going through which was lovely of her to think of. Blossom then came face-to-face with a big mechanical version of Buckbeck which she was not a fan, so she quickly decided to pull me away from. Overall, we had such an amazing time! Carmen if your reading this again you were amazing! You really made our trip the extra little bit special for us thank you! I would highly recommend you go if you blind or visually impaired. If you are worried about not being able to see anything, don’t! All the staff were great and super accommodating! If you have certain accessibility requirements, they will be more than happy to accommodate! Book Months in Advance – I highly recommend you book your tickets months in advance, they will book up so quickly. This isn’t something you can just turn up to, as it is so immensely popular! Going Around the Tour – When going around the tour either with a tour guide or on your own, take your time, the majority of the props and sets that you get to see is in the FIRST section, so take your time and look at everything, because once you leave the first section you can’t go back! Take Plenty Of Spending Money – Throughout the tour, and shop there is so much you can buy and purchase, these things are not cheap, they are quite expensive! There are now two shops at the studio tours, One during the tour and one at the end. There might some items in one shop that you can’t get in the other. So have a look in both, but in my experience, the majority of items are in the bigger shop at the end. It’s going to be very crowded – As the Harry Potter Studios is so popular all over the world, you will get lots of people going to the tour at the same time as you, both people from the U.K and tourists from around the world. If you struggle with crowds or struggle to find your way in them, then let the studios know before you arrive, that way you can be accommodated and help with this as much as possible. Going to the tour with your Guide Dog – obviously, by law, your Guide Dog can accompany you throughout the tour and other areas, when I went with Blossom they had no problem with her being that what so ever. However, it is a good idea to bring your Guide Dogs I.D booklet with you just in case you are asked to present it. They didn’t ask me in my case, but that doesn’t mean to say they might not. Also throughout the tour, once you start, there is nowhere for your dog to go to the toilet, so make sure your dog gets the chance to go before you enter the building. Going through security – When you arrive you will have to go through a security check. Don’t worry it is not too intense, but they will have to check your bag before you enter, so be mindful of this before you arrive. The ‘Harry Potter Studios’ is a fanatic place to visit, I would highly recommend it to anyone. If you haven’t got the chance to go yet I strongly suggest you do! You won’t be disappointed!! Wicked The Musical – The Untold Story of The Witches Of Oz! This post is the one I’ve wanted to write about since I started this blog. But never thought I would be writing it so soon! Like I have said before I am a massive fan of musical theatre, and Wicked The Musical is my most favourite musical of all time! After seeing the performance today, I have seen the show I total of six times. The seventh coming in a couple of weeks! After a what seemed to be a forever bus ride. I arrived to my local train station on time and got the train to London. Once arrived in London I took the Underground to London Victoria. Normally I would get assistance to use the Underground, but I knew the route so I done it on my own. Wicked is performed at the London Apollo Victoria, just a few yards (across the road) from Victoria station, so it’s really easy to get to. The tickets I had I bought were Row B (second row) in the Stalls. For anyone who doesn’t know, the Stalls are the first block of seats nearest to the stage. But the original seats were slightly off to the right and therefore were block by part of the stage set. I knew this would be somewhat of a problem for me, so I tried to phone the theatre directly first thing this morning with no success. I message them on social media, but again with no success so my hopes were not too high. So when I arrived at the theatre, I went straight to the box office and explained my situation. I said that I did not booked the tickets myself and that I was visually impaired so I would struggle to see the show and that I need to be more central to stage to have the best view. The lady who was service me took the tickets I had bought with me and went to the back. A few seconds later, she came back and said that wouldn’t be a problem and let me choose where I wanted to sit. Photo: View of the stage before the show from my seat. I must point out, that on the day I got lucky and there were seats availble that best fit me. But any reading please bare in mind, that when you go and ask for your seat to be changed if needed. The theatre might not be able to do so. It honest just depends on the day and time of the performance. Anyway, the gave me seat C25 which was three rows back from the stage and dead centre. I honestly couldn’t ask for any better! A bit of backstory about the show, everyone knows the story of The Wizard of Oz? Well, the show is all about The Wicked Witch of the West and what happened before the Wizard of Oz story. The show opened London’s West End in 2006, and has been going every since. It will celebrate its ten years anniversary this year. 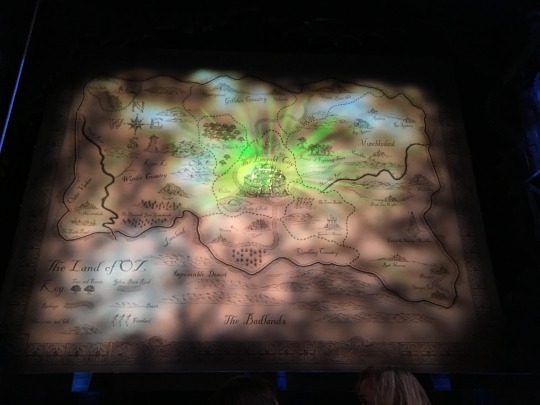 The show has had a new cast every year, but the cast you were on stage this afternoon and the current cast are as follows: Emma Hatton as Elphaba, Savannah Stevenson as Glinda and Oliver Savile as Fiyero. I would go so far to say, that this is honestly the best cast I have ever seen by far! The vocal performances off all three actors/actresses, were outstanding! 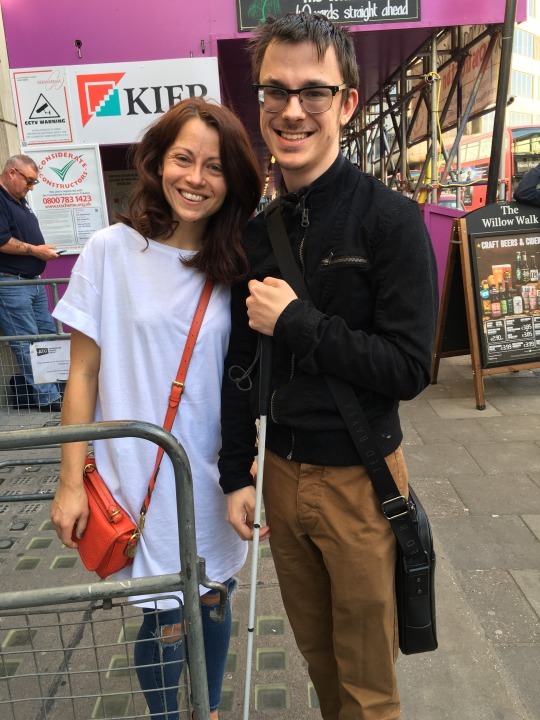 I also got luckily enough to meet Emma at the stage door after the show (photo below) I actually didn’t recognise her at first without all the green! But honestly I really talented and lovely lady! I would highly recommend Wicked to anyone!! If you ever get a chance to go seriously go! The website and trailer of the show will be below. I can honestly say now, this will NOT be the last time I see this show! I will go and see this show a thousand times more I am sure! If have got this far, when well done! I am sorry this was such a long post, but I don’t think I would be going this show justice if I didn’t Thank for reading this, and I hope you come back for more next time!